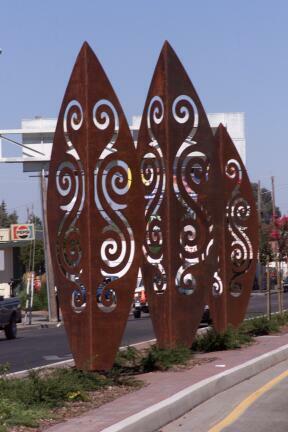 A friend just sent me a photo of this sculpture in San Jose, California, wondering if it was one of my public art pieces. Yes, one of my favorites! 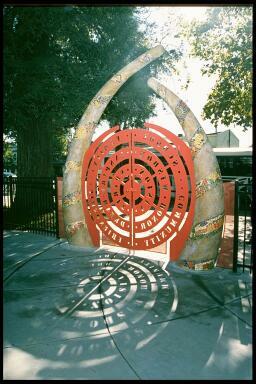 Spirit Gate located on The Alameda was designed as a ceremonial gateway for Hester School and installed in 2000. 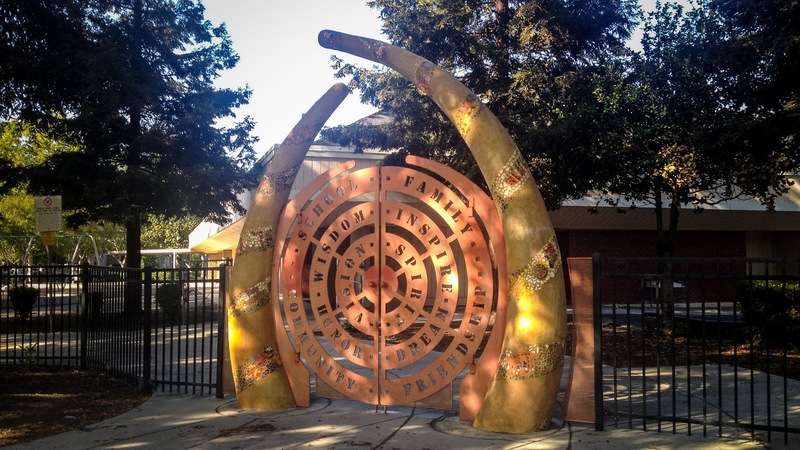 It was a collaboration between myself, Bill Gould, and the students and teachers, and supported by a Public Art in Communities Grant. 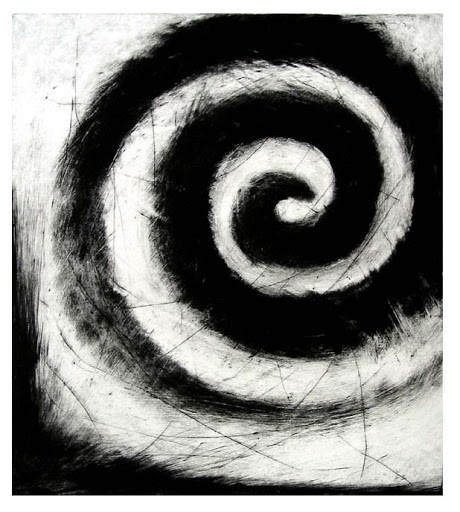 As in my 2D art, we focused on archetypal symbols inspired by the ancients – the circle and the vesica piscis. We worked with the students to choose ‘power words’ that are cut into the eight foot steel gate. 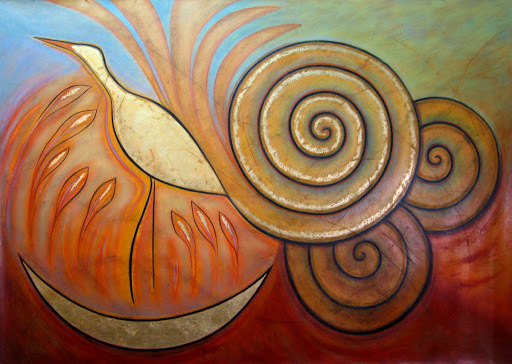 The words – spirit, vision, wisdom, dream, honor and inspire – form the inner core while family, school, friendship and community enclose the center. 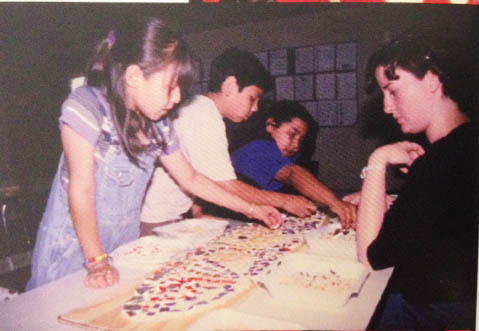 The two stucco columns are embedded with broken tile mosaics created by the students that illustrate local history. I like the way it looks like an ancient relic situated in the modern world with a design that transcends time. 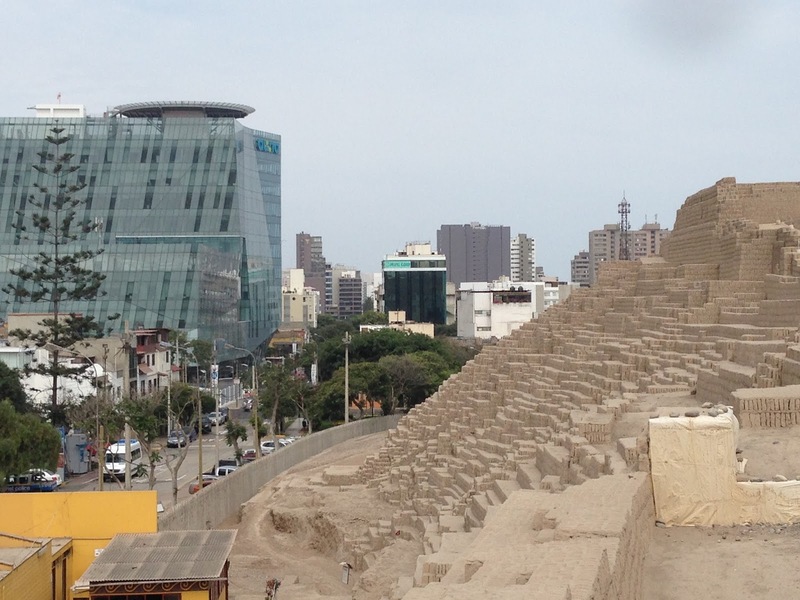 On my trip to Peru, I hadn’t expected to find a archeological site in the center of Lima. Actually, according to my reading of blogs and travel sites before leaving, I wasn’t supposed to even go to Lima much less have such a great experience. 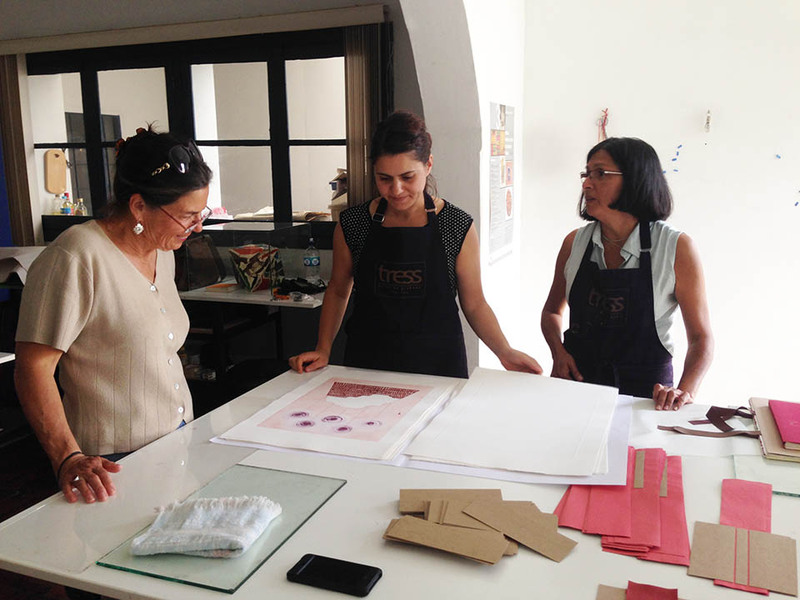 A fellow artist, Dan Welden, suggested I visit TRESS, a printmaking studio in Miraflores to meet Cristina Dueñas who runs the space. 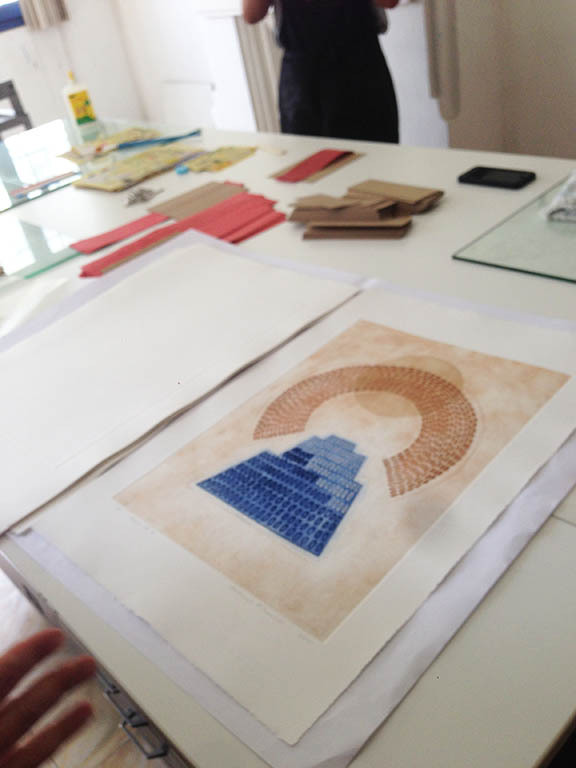 There I met Kathleen O’Connell, an American artist, who showed us her portfolio inspired by Huaca Pucllana, and told us that the pyramid was within 5 minutes walking distance from the studio. 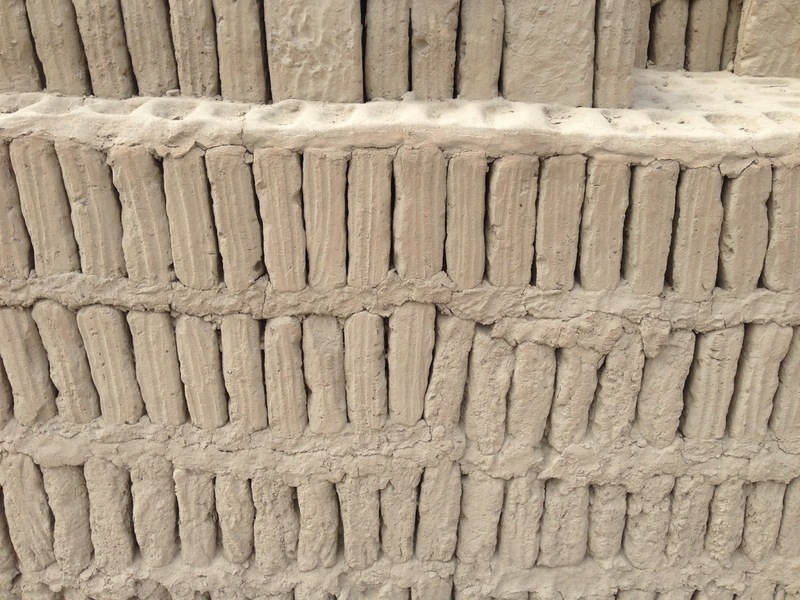 Visiting the site, we discovered that the entire structure was built of clay bricks that were dried in the sun, not in a kiln! 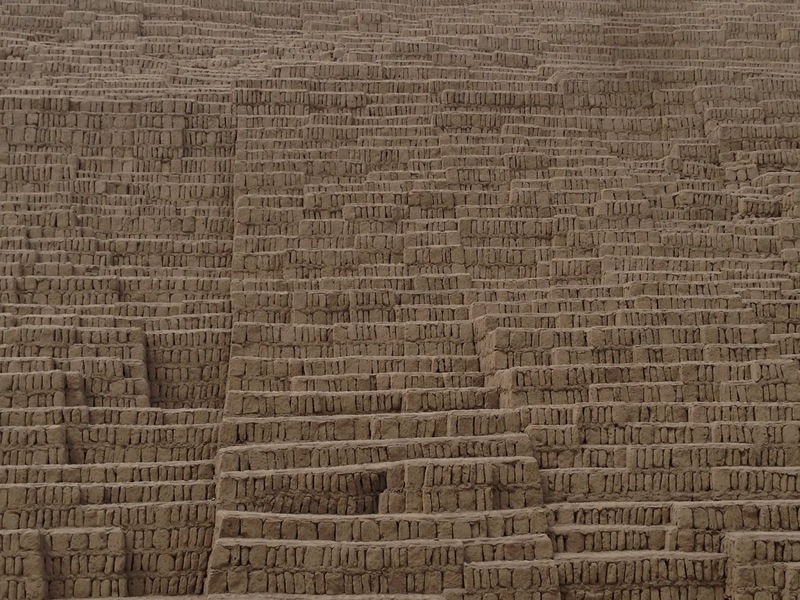 Thousands were stacked vertically, ‘libro’ or book style, to create this huge structure. It’s hard to fathom how long a process this was. 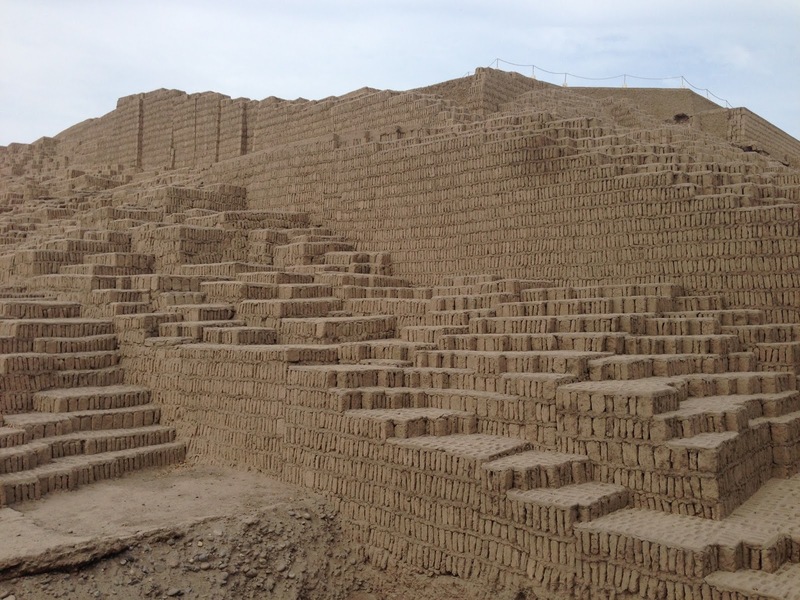 Huaca Pucllana was an important ceremonial site for the Lima Culture and dates to 200AD. Here it sits juxtaposed with Lima’s modern cityscape. 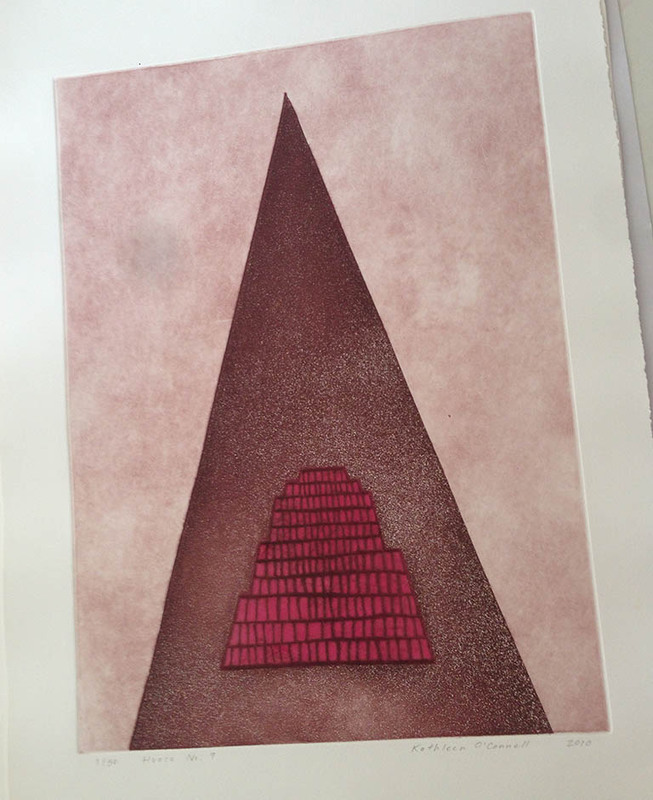 As part of my continuing Art Vacation series – I plan to take a group to Peru next May to visit sacred sites and work in the TRESS printmaking studio. Contact me if you are interested. 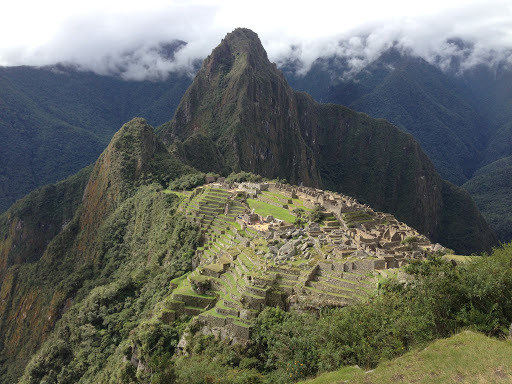 Machu Picchu, sacred site of the Incas, is so breathtakingly beautiful, so majestic, it takes your breath away. It was all I had imagined, all I had hoped it would be. With the Urubamba River snaking around the valley below and the tropical jungle enveloping the nearby terrain, it was a jewel beckoning one forward. 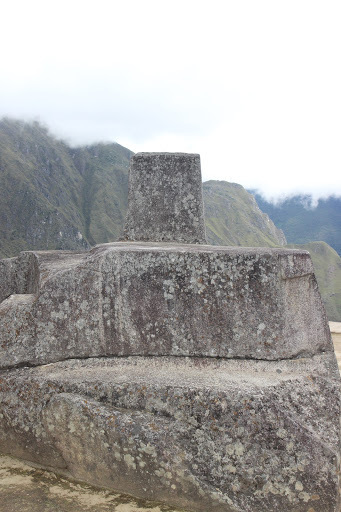 I hiked Huanya Picchu – the Mountain overlooking M.P. 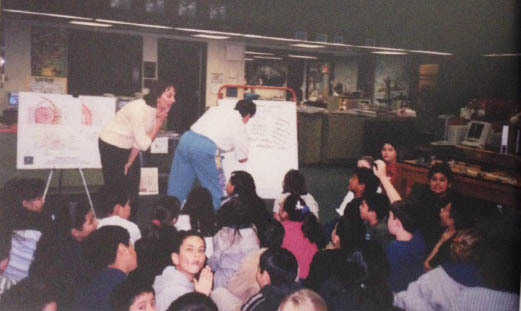 and felt an expansiveness and connection to those who came before me. 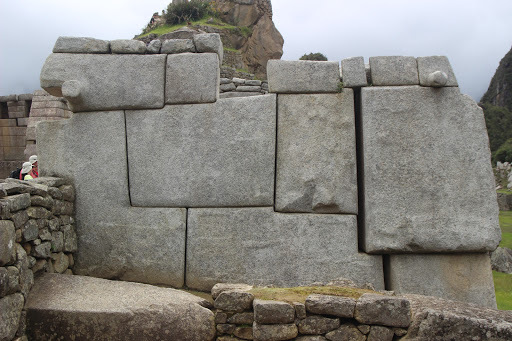 Connected with other sites in the Sacred Valley by roads, pathways, direction and visual cues, Machu Picchu does not stand alone in the landscape, but is part of a vast system of Inca cities. 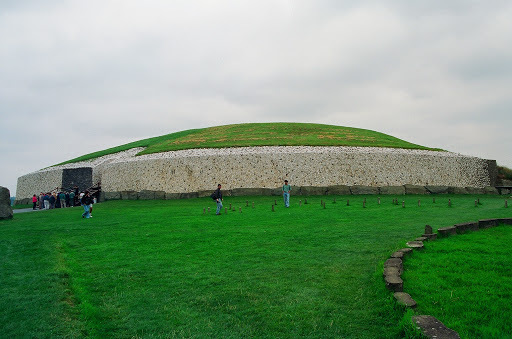 (Just like in England, where ley lines or energy lines connect the sacred sites such as Stonehenge and Avebury.) 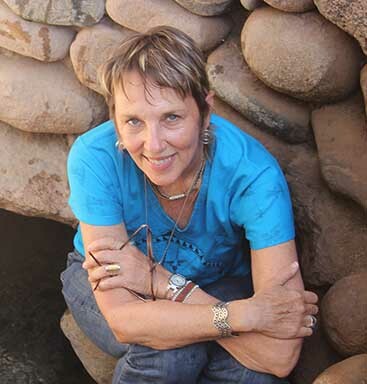 Protected by Pachamama, Mother Earth, one can feel the sensuality of the land. Because Machu Picchu is so isolated, and the trail to get there so convoluted, it is thought to have had such a special significance in the Inca kingdom that people made pilgrimages there. 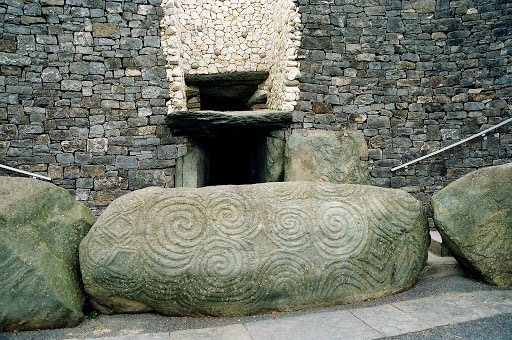 Huge stones formed temples, buildings unfathomable in this isolated location. 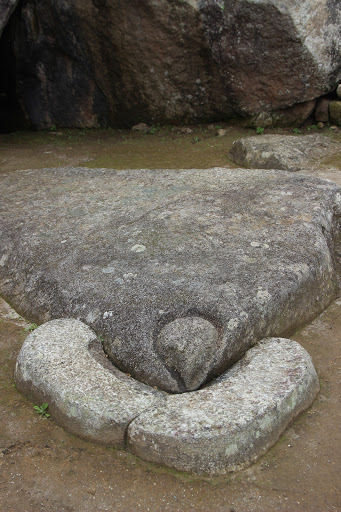 How were these boulders moved, cut, and situated with such precision? 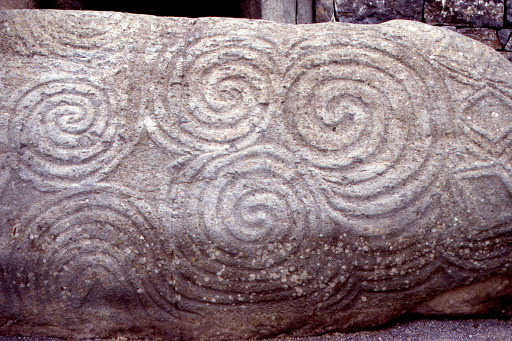 Legend tells us that they were ‘whipped into place’. Hmmm….